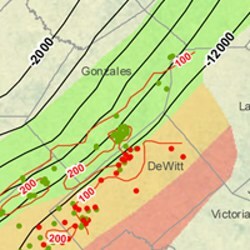 Gonzales County (1,070 sq miles) lies in south Texas above a shale play known as the Eagle Ford shale. The county is targeted for the liquids-rich nature of the Eagle Ford formation in this area. The county is part of the northern region of the Eagle Ford play where the oil trend narrows. Recent drilling in nearby Fayette County is extending the play past Gonzales. Activity in the county is focused in the shale oil window in the southwest third of the county. The geology in the northwest portion of the county is not likely suitable for development as the Eagle Ford is much more shallow and the thermal maturity of the oil is lower. County services of interest to oil and gas lease owners include the Gonzales County Appraisal District (tax collector) office and the Gonzales County Clerk(property records) office. The county seat is the town of Gonzales, named in memory of Rafael Gonzales, a Governor of one of the United Mexican States. Other towns in Gonzales County include Nixon, Pilgrim, Smiley, and Waelder. Join the Gonzales County Discussion Group today - your voice counts! MineralRightsForum.com is a discussion network for mineral owners, royalty owners, and industry professionals to discuss oil & gas related topics. EOG Resources is the most active operator in the county.